The world television premiere of the recent movie, Airlift produced and directed by Akshay Kumar also starring Nimrat Kaur is set to be aired on the Hindi TV channel Colors. The movie is an entertaining and uplifting story of the largest human evacuation ever in the human history following its captivating plot and storyline. The storyline of the movie plays around a wealthy businessman based in Kuwait Ranjit Katyal (Akshay Kumar) carrying out an evacuation of the Indians living in Kuwait during the Saddam Hussein’s reign in the invasion of Kuwait. In the same scenario, the Indian wealthy businessman treats himself as a Kuwait citizen but in the long run, he realizes that the influence he had on the Iraqis is diminishing and his family is now in a great danger like the other Indians. Ranjit Katyal becomes the only hope for the 170, 000 Indians seeking a way out of the Iraqis invasion. Through struggle and consigned efforts, they manage to subsist the Kuwait traumatic time by beating all odds traveling across the border a thousand kilometres into Amman, Jordan. From this point, the Indian government successfully flew approximately 488 Indian commercial flights to fight and evacuate all the thousands of Indians safely back to their homeland in a period of over sixty days. This remarkably makes it the largest and successful evacuation process ever tried by any other country in the whole world. Among the starring crew in the cast includes; Akshay Kumar featured as Ranjit Katyal; Nimrat Kaur featured as Amrita Katyal; Feryna Wazheir featured as Tasneem; Inaamulhaq featured as Major Khalif bin Zayd; Purab Kohli featured as Ibrahim Durrani; Lena featured as Deepti Jayarajan. The movie will set an emotional social message to the viewers due to its incident of war, torture, predicament and asperity of Indians living in Kuwait. The chancy rescue operations and speculative evacuation attempts to save the lives of innocent Indians sets benevolence moods in the movie setting a fervent social message. 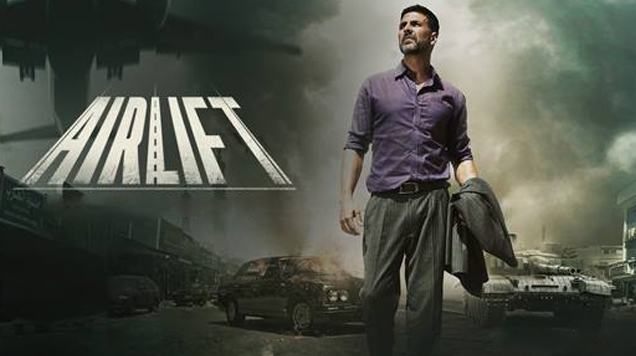 The world premiere Airlift movie to be aired on Hindi TVchannels, Colors TV live is a must watch movie having a captivating plot and dazzling story line with its unique set up and wonderful casting crew.